Length of Show: The great thing about this "one man - multi-star" show besides the popular Martini Men performances is that it is easily tailored time-wise to fit any event's schedule. For dinner theater-style two-hour performances, there are 4 individual 25 minute sets. Show opens with the first 25 minute set, followed with a small 5 minute transition "break" to change costumes between it and the second 25 minute set. At the second set's conclusion show is then at halfway mark, followed by a 10 minute general intermission, perfect for guests to stretch legs a bit, order more drinks, etc,. Second half of show proceeds much like first half, with third set of 25 minutes, with small 5 minute costume change followed by fourth and last set. (total time 115 minutes, plus 5 minutes to spare for bows, etc. You can also choose your favorite "Martini Men" for your personalized show, as some fans may only want "Dean Martin" as pictured above, for a 30 or 60 minute performance, or maybe a combo of "Dean and Frank' or "Bobby and Tony," or "Tony and Andy," or "Andy and Paul," etc., so it's very flexible and you get the star "Martini Men" you and your guests want. "Dean, Frank, Bobby, Tony, Paul and Andy" can also be engaged for a solo performance only, as each can put on a one hour performance of "their" greatest hits! As a national "Las Vegas-style" show coast to coast, this is a very real entertainment value as this being a one-man show, only one plane fare, hotel room is needed. Show is actual live singing performances in the vocal impression of each Martini Man, and for each the look and feel is also implimented for a full impersonation of each. Vocals are mixed at the sound system with professional backing tracks to give the effect of a full, live big band accompanyment for recreating a legendary live concert performance! If you know and recognize the brand names of our professional sound equipment...you'll be impressed! Our ampliphier is 1500 watts of pure clear power, enough to fill a room of up to 450 guests. The 2 matching full range speakers are JBL 15" with titanium tweeters, mounted on Ultimate stands for maximum extention and safety. Both live vocals and backing tracks are "mixed" on a top brand Mackie DBX 12 channel mixer with all kinds of bells and whistles like equalizers, reverbs and balance, for that classic showroom sound. The backing track cd player is a Pioneer 2 tray pro unit, for perfect reproduction of those lush full orchestra sounds. The microphones are again, top of the line. One is a Shure Beta SM 58 Wireless (considered the best there is!) and also a cabled Shure SM55 styled like the classic microhones of the 50's yet packed with todays top technology..it sits on a classic chrome mike stand. 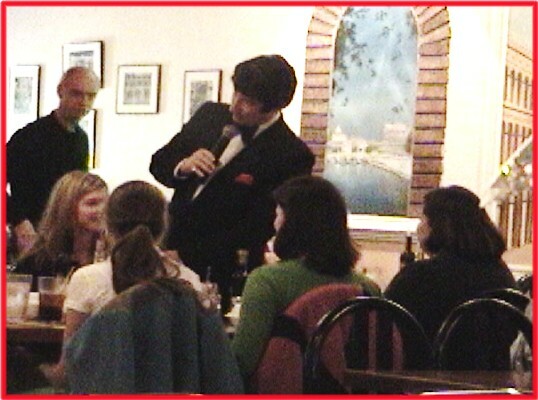 One of the most popular and unique elements to The Martini Men shows is the level of fun audience interactions. For certain songs, "Dino" might invite a lady or two or even three to join him onstage as honorary "Gold Diggers, " in the role of the beautiful chorus girls you may remember from his popular TV show. The gag begins when "Dino" also produces feather boas and glittering tiaras for extra "glaming up" as they saunter around him a bit during his song like "You're Nobody Till Somebody Loves You." This is done similarly for "Frank" in his song "Luck Be A Lady Tonight." The cameras really come out on this fun feature and capture the fun! All of The Martini Men will also come downstage and serenade for happy anniversaries, birthdays, newlyweds, bachelorette parties...any celebration! "Dean" serenading a table of ladies! This show has high visibilty in a moderately sized area. Minimum space needed is a typical 8' X 10' area. A typical "riser" of 18" or 24" to be provided at the venue is ideal for maximum visibilty and enjoyment of the audience. For "complete show" contracts within a drivable range, (450 miles radius of Virginia Beach, VA) we bring an array of theatrical and special effects lighting plus "Las Vegas" them props like a slot machine and "large martini glass lamps" to add to the visual "pop" of the show. The really unique special effects lighting include a "flaming" effect light that adds flavor to "Dean Martin's "In The Misty Moonlight By The Flickerin' Firelight" tune, and likewise for "Frank Sinatras' blue toned jazz classics like "It Was A Very Good Year," we fill the scene in a blue-tone light....and for something "hot" like "Bobby Darin's "Mack The Knife" a good ole shade of "blood red" fills the stage! 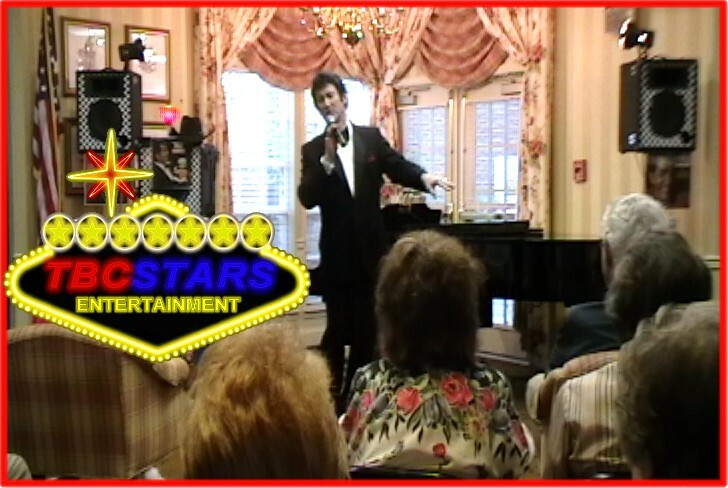 Also see more of TBC Stars variety of shows and entertainment offerings! Be sure to see the videos on each web page, too! We love to talk, and sorry, we don't text!